.’s is an instrumental R&B/funk band that was influential in shaping the sound of Southern soul and Memphis soul. Original members of the group were Booker T. Jones (organ, piano), Steve Cropper (guitar), Lewie Steinberg (bass), and Al Jackson, Jr. (drums). 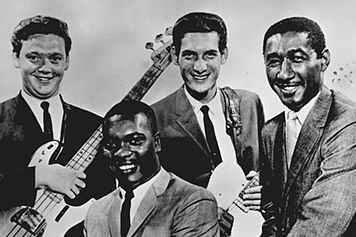 In the 1960s, as members of the house band of Stax Records, they played on hundreds of recordings by artists such as Wilson Pickett, Otis Redding, Bill Withers, Sam & Dave, Carla Thomas, Rufus Thomas, Johnnie Taylor and Albert King. They also released instrumental records under their own name, such as the 1962 hit single “Green Onions”. As originators of the unique Stax sound, the group was one of the most prolific, respected, and imitated of its era. By the mid-1960s, bands on both sides of the Atlantic were trying to sound like Booker T. & the M.G.’s. In 1965, Steinberg was replaced by Donald “Duck” Dunn, who played with the group until his death in 2012. Al Jackson, Jr. was murdered in 1975, after which the trio of Dunn, Cropper and Jones reunited on numerous occasions using various drummers, including Willie Hall, Anton Fig, Steve Jordan and Steve Potts. The band was inducted into the Rock and Roll Hall of Fame in 1992, a the Musicians Hall of Fame and Museum in Nashville, Tennessee in 2008, and the Memphis Music Hall of Fame in 2012.
was one of the first racially integrated rock groups, at a time when soul music, and the Memphis music scene in particular, were generally considered the preserve of black culture. You must have enjoyed their performance, Donna. These guys have some amazing sounds! Takes me back and it so good in spirit to share so much. Happy Monday to you! Their performance was great! Definitely still got it. 👏🏼 Yes, it’s so great to find a kindred spirit in you. Happy Monday! Agree. I love your taste in music! A long line of hits with these guys! Such cool beat, such great music. This band was actually ahead of their time. Classic in totality! Thanks Thom for stopping in and commenting!